Every day is filled with choices. Do I work out or sleep in? Should I have a smoothie or a breakfast sandwich? Since you’re here, I’m guessing you’re a lot like me in that you try to go for the better-for-you options when possible. I opt for the early class at the gym so that I have time to get sweaty and still shower before my first meeting. I choose a splash of cashew milk in my coffee instead of going for the cinnamon latte with whipped cream. (Most days, anyway.) I make a conscious decision to step away from my electronics during lunch and enjoy a short break in the middle of my workday. And all of this works because they’re simple choices to make. (Let it be easy, you know?) I found a gym I love, I keep cashew milk and coffee handy, and I block off my calendar at lunchtime to ensure I’m able to take a break. The other really easy choice I’ve made for my health is incorporating a standing desk so that I don’t spend my whole work day sitting in a chair. Think about it — it makes no sense to work your booty off to be healthy before and after work … and then ignore that whole aspect of your lifestyle for the eight hours you spend bringing home the bacon. 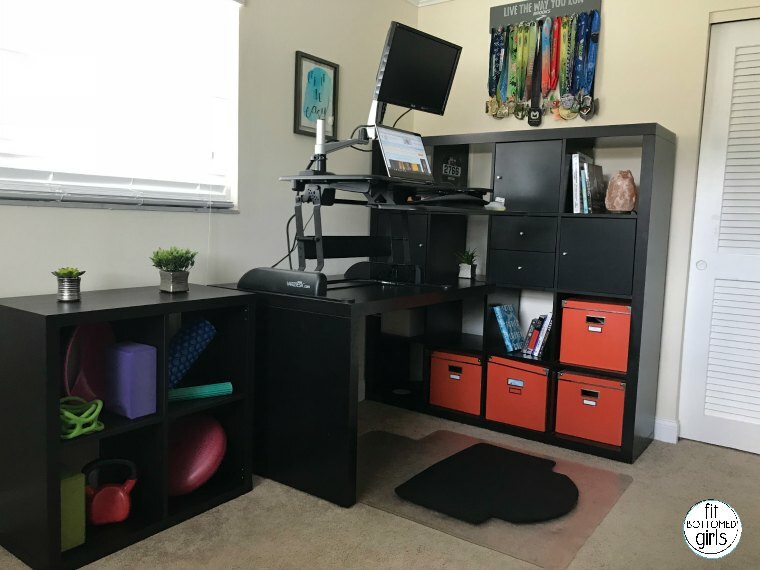 I have a VARIDESK PRO PLUS 36, and I love the fact that it makes choosing to take an active, standing posture easy as can be. Seriously — with a touch of a lever on either side and a gentle pull, the PRO PLUS 36 goes from a sitting to standing desk in a moment (and back again just as quickly and easily when my feet want a break). It’s not like this adds anything really new or challenging to my routine. I mean, I would love to get into the habit of doing a quick, short burst of 10 squats or five burpees or something every hour, on the hour, or taking my dogs on a few short walks throughout the day — both of those things would certainly make my work day more active! But they throw off my groove, so while it’s awesome to do that on occasion, they’re just not feasible for me on a busy day. But going from sitting to standing? No problem whatsoever. It’s done before my email loads. Now, you probably already know that changing up the position in which you’re working is good for your body (although, if this is news to you, we’ve got a podcast ep you’ve got to check out! ), and standing certainly burns more calories than sitting — but did you know that working while standing can also help your productivity? True story! One study actually found users of stand up desks to be 45 percent more productive than their seated counterparts. WHOA. This is also super helpful for people who do their best thinking on the move (like yours truly — I should track how many miles I log while pacing and brainstorming each week). It might not sound like a huge hurdle, but having to push my chair back, stand, and then pace honestly keeps me from doing it more often than I’d like to admit, but when I’m standing, I simply turn away from my screen and let my mind go to work. Good for my body, good for my brain, and, in the end, that’s good for you guys, because you know you get all my best ideas! 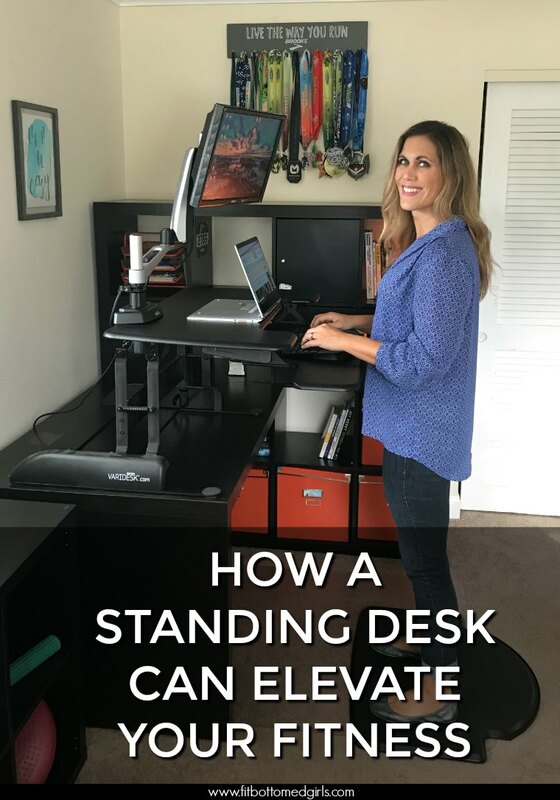 I will say that transitioning to a standing desk can present a few challenges, because, well, you’re asking your body to do something new — something that uses more energy. In time, you will find that standing more equates to increased energy, but to start, you might experience a bit of fatigue. But that’s why it’s great that the VARIDESK standing desk solutions, like mine, go from sitting to standing and back so easily! Just as you’d build up from a 5k to a half marathon, you build up from sitting for eight hours at a time to standing for longer and longer periods, and before you know it, you’re on your feet for much of the day (and your pants might start feeling a little looser to boot!). Whenever we change things get better, change is always necessary. Love the desk! I work from home, so it’s easy to not move much. I also drink a lot of water, which means U use the bathroom a lot. Whenever I have to go, I use the bathroom upstairs. It’s not a ton of extra movement, but it is better for my heart and strengthens my muscles just a little but more. So worth it! This is such a fab idea, it’s so bad to sit behind a desk all day. My husband paces while he’s on work calls, for 2 reasons, exercise and stress!! At least he’s trying to relieve one with the other.